Let’s get two thing straight: 1.) Not everyone will be a sailor, just like not everyone will be a cellist or a fly fisherman; and 2.) Not everyone will be a mentor, just like not everyone will be a parent, or a teacher, or a coach. It takes a certain person to commit the time it takes to “be” a sailor, just as it takes a mentor to commit the time to teach a sailor. 1.) It’s not the place or the program, it’s the person. If you want to help kids in cities develop an appreciation of the natural world, of course you will need some vestiges of the natural world in the city. Thus, the park. If you hope that kids will deepen their appreciation by learning more about one natural subject or another, you will create programs in the park. You might find a volunteer who knows about bats to give a talk each Thursday at dusk. However, the kid who is inspired to become a wildlife biologist focusing on nocturnal mammals doesn’t do it because of the park or the program, but because of the volunteer’s authentic, contagious enthusiasm for bats. It’s usually as simple as that. 3.) Mentoring is teaching infused with leadership; it is the art of issuing a challenge that is just barely out of reach. Mentors help apprentices understand and set goals. As goals are achieved, apprentices begin to trust the process and the mentor, while improving skills, and then new goals come into view. Reaching these goals is how confidence is created. 4.) It’s a simple, long-term investment. Mentors and apprentices give their most valuable resource to the relationship: time. And here, in the continuum of teaching through shared fun and feedback over long stretches of time, we find sailing in its rightful place: the challenging lifelong free time pursuit that many of us know and love. The best part of mentoring is that once it starts, it usually grows. Think, for example, about a great sporting coach from your childhood. Now think about all the great coaches that your coach inspired. Mentors make their own. So where might you start mentoring? Look for the first kid that you see with their nose buried in a smart phone or their thumbs stuck to a game controller. Your kids. Your kid’s kids. The neighbor’s kids. Interested in Saving Sailing? Start mentoring now. Start on your boat, and if you don’t have one, borrow one. If you can’t borrow one, then go where there are boats to use. Your sailing life is sure to take on a completely new and more interesting form when you do. 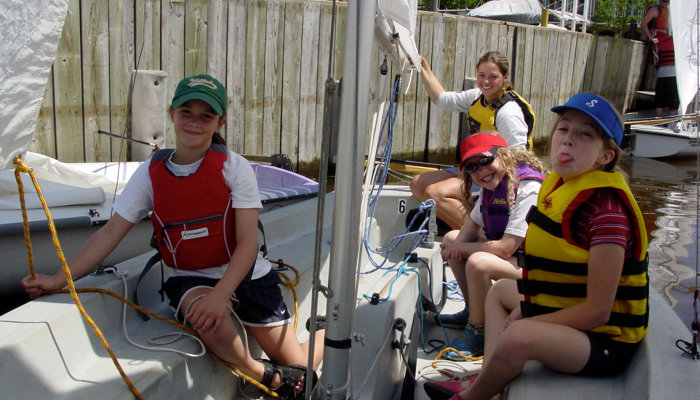 If you or your club are interested in sharing ideas, feel free to email me at nickhayes@savingsailing.com. You are currently reading On Making Sailors at Saving Sailing.